Two tractors - one towing a muck spreader - have crashed leaving a huge slurry spill covering a Cornish road. One of the tractors rolled on to its side in the crash on the B3266, near Camelford at around 16:15 GMT. 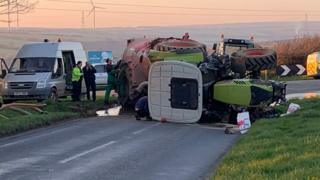 Both drivers were able to get out of their tractors and were not injured, but the road was closed for a major clean-up. Devon and Cornwall Police advised people to avoid the area and "possibly keep their windows closed".